Taking a look back at 2015, an interesting trend to emerge is the popularity of Adult Colouring Books. Adult colouring books are now topping the charts at both online and local retailers. This month, six of the top 20 best-selling books on amazon.co.uk were adult colouring books, down from a high of nine in the top 20 in December, during the pre-Christmas buying frenzy. And at Waterstones, Cambridge, the store’s foyer was filled with an array of adult colouring books, bright leaded pencils and gel pens, and shoppers crowded around the large display to make their selections. With our increasingly stressful lives, it appears colouring is coming to the fore as an inexpensive way to de-stress and find some inner calm with art-therapy. There’s something for all the age groups, even children. Amid all the Scandinavian folk themes and Japanese patterns, the huge underpinning theme is anxiety: the Art Therapy Colouring book, Calming Art Therapy, Colour Therapy, Can’t Sleep Colouring, etc., There is a crossover with mindfulness and also with mantras: activities in which the brain is engaged just enough to stop it whirring, but not so much that the concentration is draining. This craze originated from France and is spreading world-wide. 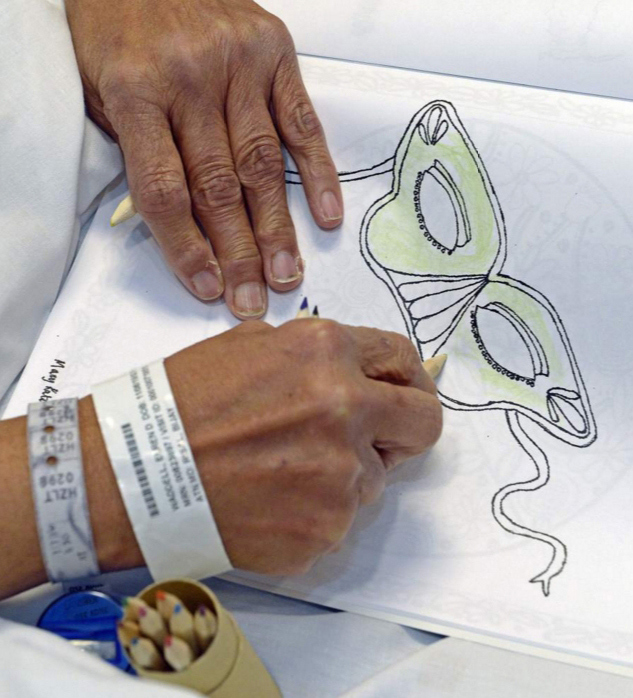 In Louisiana, Baton Rouge General is trialling adult colouring as a therapy for its patients. Grown-ups at the hospital are receiving colouring books; a new tool meant to calm patients and their families during stressful times. Since Christmas, the artists that work and volunteer at the hospital have distributed the colouring books to patients in the burns unit as a pilot program to test the new concept before it goes hospital-wide. Last week, Elren Waddell, 61, a nurse supervisor at The General receiving treatment for septic shock syndrome, was given a book and coloured pencils to try it out. Colouring helped get her mind off the weeks she has spent in the hospital. “When you create, it helps you drift away from the things you don’t want to deal with,” she said, sitting in her hospital bed colouring a daisy in the book. If you’d like to try your hand for free you can download and print an image for colouring in here.